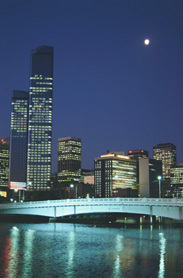 The capital of Victoria city and in the eyes of many, the cultural and gourmet capital of the southern hemisphere. A city of tree-lined boulevards and gracious elegance, with a world famous botanic garden at its heart, the 'upside-down' Yarra River meandering lazily through the centre; soaring glass edifices rub shoulders with a stately architecture from an era popularly known as "Marvellous Melbourne". Both high tech and resolutely historic, Melbourne is at once distinguished 'establishment' and curiously avant garde in its thinking and style. Coolly appraising on the surface, not far below she is warm, welcoming and an exciting destination. A truly multicultural, progressive city with a farrago of vibrant influences from all over the world, Melbourne's old world charm is still retained in the network of trams trundling through the length and breadth of this expansive megalopolis.